Our commitment to protecting Canadians with autism. That’s why MedicAlert is proud to partner with Autism Canada, a leading advocate for those with autism and their families, to help keep you or your loved one safe in an emergency situation. A MedicAlert ID can be the difference between a tragedy and a happy ending. The new MedicAlert Autism Program includes one year of MedicAlert protection, a free ID and shoe tag, plus complimentary shipping and registration, at a cost of only $60 to new subscribers. Autism isn’t always recognizable to those who don’t know the signs.With MedicAlert protection, there’s an effective way to identify the subscriber, understand how to de-escalate a potentially volatile situation or reunite a lost subscriber with family or caregivers. Here’s how the program can help. Emergency responders and police know to look for the authentic MedicAlert ID. If an individual with autism is unable to communicate, the MedicAlert ID tells emergency responders and police about their condition and empowers emergency response teams to make informed decisions. We securely store subscribers’ electronic medical and personal profiles on file and make them available to emergency responders and police within seconds. This profile can include everything from known routines, anxiety triggers, and de-escalation techniques to other medical conditions such as allergies. Emergency situations can happen any time, day or night. Our exclusive 24/7 Emergency Hotline ensures that emergency responders and police will be able to access vital personal information around the clock. Individuals with autism may be distressed by new surroundings and people. The exclusive Family Notification Service quickly notifies caregivers and family to let them know the situation and whereabouts of the subscriber, reducing stress for everyone. For safety and peace of mind, sign up today. To sign up, specify how you heard about the program and choose 1 of the 4 MedicAlert Autism Program IDs. Ensure the subscriber wears his/her MedicAlert ID at all times. 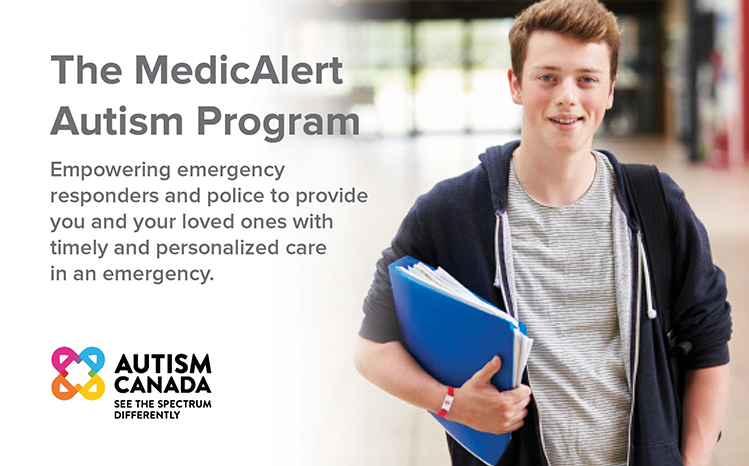 Keep your MedicAlert Autism Program contact information and personal and medical profiles up-to-date by calling 1-877-217-7448 or emailing customerservice@medicalert.ca. Autism Canada is the only autism advocacy organization with a national perspective on the issues currently facing those with autism spectrum disorder, their families and other stakeholders. Together with our counterparts, we collaboratively work to share expertise, build consensus and help inform public policy, and research. In addition to encouraging the sharing of best practices across provincial and territorial boundaries, Autism Canada actively promotes national dialogue on the most effective strategies for building equitable access to funding and services. The MedicAlert Autism Program is available to new subscribers with autism only. Limit 1 free ID and shoe tag per subscriber. Standard shipping only. Offer applies to prepaid service plans only, cannot be combined with any other offer, some exceptions apply. Existing subscribers may join the MedicAlert Autism Program by calling customer service and purchasing an eligible ID and shoe tag for $39 + tax.